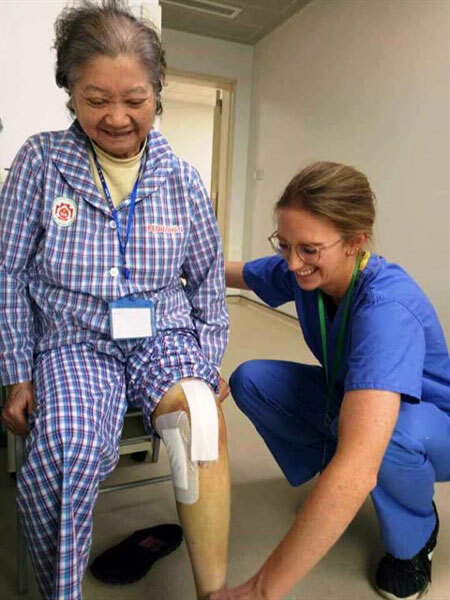 VietNamNet Bridge – The 108 National Military Medical Hospital in collaboration with the Operation Walk performed artificial knee and hip joint replacement surgery for 100 poor patients as part of a humanitarian programme taking place in Hanoi from March 25 to April 5. “Joint replacement is a complicated medical technique that requires replaced joint matching with each patient’s age and pathology,” said the hospital’s Joint Surgery Department deputy director Nguyen Quoc Dung. “All expenses of artificial hip and knee joints, each worth VND48-50 million (US$2,100-2,200), were funded by the progarmme,” said Dung. Dung added that patients were diagnosed with knee and hip joints problems or walking difficulties, can register for free replacement surgery at the hospital’s Joint Surgery Department at No 1 Tran Hung Dao Street in Hanoi. This year is the 9th time that US based Operation Walk has visited Vietnam to transfer new techniques in replacing knee and groin joints to the doctors of the 108 National Military Medical Hospital. Operation Walk is a US based humanitarian organisation that provides free hip or knee replacement surgeries to patients in developing countries, including Vietnam, Laos, Cambodia and Myanmar. About 1,000 patients have been provided with free knee and groin surgery under seven co-operation programmes between the hospital and the US and Ireland Operation organisations.